Chiroubles lies at the highest point of the Beaujolais Crus, and the village nestles in a perfect amphitheatre of steep slopes and decomposed granite soils. The wines from the commune possess a striking red colour, and are supple, bright and elegant, with high-toned floral notes, and at their best an unctious richness of clear red fruit. Domaine Cheysson was founded in 1870 by Emile Cheysson, who was apparently variously an undertaker, a sociologist and a statesman. One cannot help but wonder in which order. Cheysson built the current house over the rather more venerable existing cellar, and would retreat here whenever he could to make wine and tend to his livestock. The domaine, which comprises some 26 hectares (60 acres), is now run by Jean-Pierre Large of Morgon. 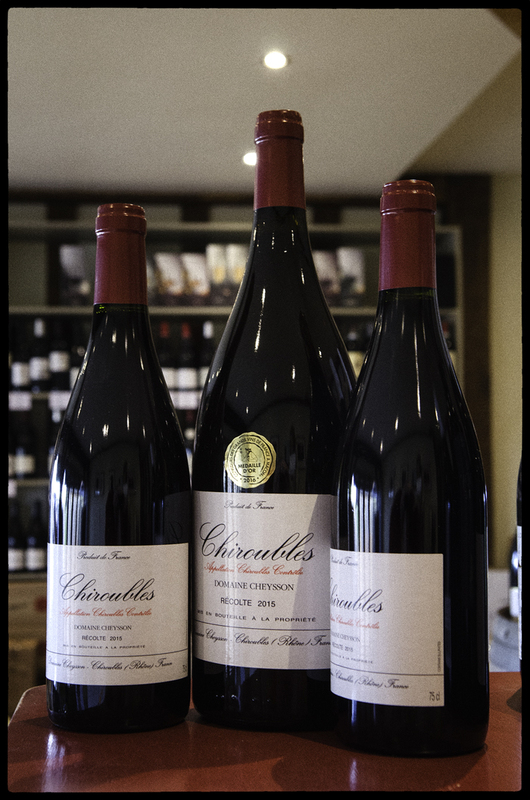 The wines that he crafts here are characteristically bright, fruity and perfumed, with pronounced red fruits – redcurrant, wild strawberry, a twist of sour cherry, all goriously sleek and utterly delicious. Though in good years the wine is capable of ageing for a decade or more, it is so irresistible in its first year or two that I suspect it rarely is given the chance. This is quintessential high-altitude gamay, and I could quite happily live with little else.